North Battleford is the seventh largest city in Saskatchewan, located in the west-central region of the province. It is among the fastest growing Saskatchewan communities, with a population of about 14,000 residents. In 2014, the City of North Battleford developed a Community Safety Strategy to address real and perceived safety for residents in response to increased crime. They utilized a 5-pronged approach to address criminal activity and factors contributing to safety concerns. As part of an effort to prevent and suppress crime, City planners used Crime Prevention Through Environmental Design (CPTED) as a framework for improving the safety of public spaces in the downtown core. North Battleford has faced some unique challenges when it comes to safety in the downtown core. The City focused on increasing the amount of lighting and enhancing the overall downtown aesthetic to enhance the environment. By increasing safety through design, they hoped to encourage legitimate users in public spaces while deterring criminal activity. The goal: to create a more inviting, active area for the public to enjoy. In addition to enhancing lighting in public spaces for the purposes of reducing and preventing crime, the City of North Battleford was also looking for a style that suited their modern aesthetic and provided some cost-savings. That’s where ATS Traffic came in. In 2017, the City reached out to our Saskatoon team looking for a better outdoor decorative lighting solution for their community. With no private power providers in their area, North Battleford relies on the Provincial Crown Company for lighting. There are few options available and many have been established throughout the province. The City was looking for a design that would set them apart – on top of offering increased power and lowering their costs. That is why North Battleford selected First Light Technologies’ SCL2 and PLB Solar Bollard. 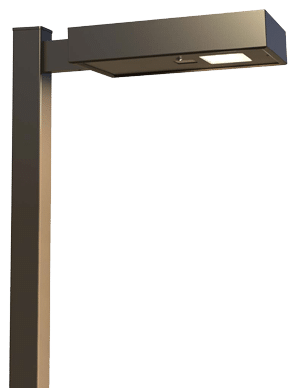 Through consultation with ATS Traffic and First Light Technologies, the City of North Battleford selected the SCL2 Series Solar LED Integrated Commercial Area Light and PLB Architectural Solar Illuminated Bollard. ATS Traffic installed 22 Commercial Area Lights and 26 Illuminated Bollards on city streets. 21 more Commercial Area Lights were added, along with 23 Illuminated Bollards. While quantities are still TBD, ATS Traffic will install more of both technologies for the City. The SCL2 Series Solar LED luminaire is often used for commercial, parking lot, recreational bike-way/pathway and public space lighting applications. The self-contained, unobtrusive design integrates its solar power, adaptive control and LED technologies into a compact and efficient form. With robust construction and high performance, the SCL2 series is an excellent fit wherever cost effective, full cutoff lighting is required. 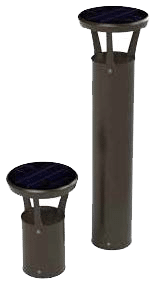 The PLB Architectural Solar Illuminated Bollard provides cutoff lighting for pathways and outdoor spaces. With contemporary styling, these self-contained fixtures do not require electrical design, wiring or trenching and only take about 15 minutes to install using a screw pile. The long-term cost savings for municipalities and their tax payers with utilizing solar technology can be substantial. On average, solar lights cost about 50% less to run than wired lighting. For communities that are attempting to decrease crime rates and increase safety for local residents, First Light Technologies offers a cost-effective option with a modern aesthetic. Overall, the City of North Battleford has been extremely pleased with the outcome of their outdoor lighting project. Many of the community’s residents are in favour of solar energy and are excited to see this technology being used on their streets. The sleek, modern style of the Luminaire poles and bollards give the downtown core an enhanced aesthetic, while increasing visibility and the perception of safety.